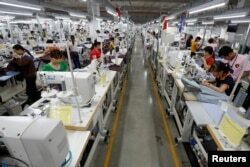 How Will Foreign Investment Change Vietnam’s Economy? Vietnam is among the fastest-growing economies on the planet, attracting countless foreign investors to its southern business hub of Ho Chi Minh City. Vietnam's cheap workers might not be the country's stars for much longer: low wages helped to propel the communist nation to some of the fastest growth rates in the world, but analysts say it needs a new economic model now. After a slow recovery from the Vietnam War, the Southeast Asian country saw gross domestic product rise year after year from the 1990s on. That was built on the back of low-cost labor and factory-driven exports, as well as companies’ increasing tie-ins to foreign investment. FILE - Laborers work at TAL garment factory in Vinh Phuc province, Vietnam, May 23, 2017. Vietnam is currently at a turning point, looking back at simple exports like rice and Reeboks that helped it develop, and looking forward to a more advanced economy along the lines of Taiwan or South Korea. Locals do not want “Made in Vietnam” to signal low quality. They also want to integrate into global trade, without the backlash against globalization seen among populist voters from Europe to the United States. He was referring to the Doi Moi reforms that began three decades ago, when Vietnam started to introduce more and more traits of a market economy into its system, like private ownership of firms and houses. Hanoi is conducting a review of how well Doi Moi turned out, and how to chart an economic path for the next three decades. Advisers have put forward ideas of how the new economy could look in Vietnam, among which are three common themes: the internet and other high-tech sectors will dominate; businesses will move into services and other value-added industries rather than physical goods; and employees will constantly update their skills through life-long learning. FILE - Men work with an engine at automaker Ford Vietnam's factory in Vietnam's northern Hai Duong province, outside Hanoi June 27, 2014. For example, Vietnamese factory hands are accustomed to assembling phones and cars, but could they one day move up the value chain, such as by providing tech support to people who buy these products? On the technology side, Vietnam could do more to collaborate with the rest of Southeast Asia, according to Pham Hong Hai, CEO of HSBC Vietnam. That may range from ensuring electronic payments go off without a hitch across borders, to cooperating on a response to cyber threats, he said. The other vital theme has to do with the workforce, making sure its productivity and skill levels improve. Millions of Vietnamese now rely on entry-level jobs to make a living, whether it’s gluing together wallets at a factory, or picking coffee cherries on a farm. FILE - Terraced rice paddy fields are seen during the harvest season in Hoang Su Phi, north of Hanoi, Vietnam, Sept. 18, 2015. That was the work that used to attract foreign investors to the country in droves, but not all of those jobs will last. So groups from government agencies to charities are enacting education and training programs to equip locals with skills for the future. This is meant not just to increase job security, but also to prevent Vietnamese from feeling left behind or bitter if jobs get off-shored to cheaper countries. Vietnam hopes to avoid the populist resentment of other parts of the world, as well as the trade protectionism that has created. To that end Vietnam is turning to partners like Australia, which has supported projects that allow the fruits of economic success to be spread more widely. 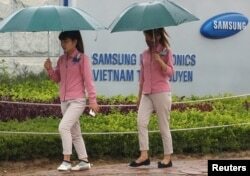 FILE - An employee (L) holds a smartphone as she is on the way to work at the Samsung factory in Thai Nguyen province, north of Hanoi, Vietnam, Oct. 13, 2016. Vietnam set out on a new “chapter that embraces innovation, promotes bold reform, and helps Vietnam achieve its ambitious development goals,” said Craig Chittick, the Australian ambassador in the country of 100 million people. His government has backed programs in Vietnam like the KOTO center, which teaches hospitality skills to street children, as well as a contest to invent technologies useful to rural women and a forum to promote impact investing. The idea is that not all groups have benefited from past economic growth, but there is still a chance to change that in the new Vietnam.